The air ducts in your Arlington home do a substantial amount of work that you are probably not even aware of. They provide a route for the conditioned air from your home heating and cooling system to the living areas of your home, and they usually house all of your indoor air quality equipment as well. 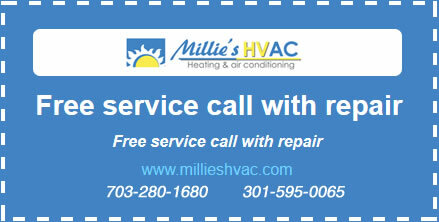 Since they do play such an important role in keeping your home safe and comfortable all year long, Millie’s Heating & Air Conditioning is proud to offer comprehensive duct sealing services to homes all over the area. Our expert technicians have all of the latest tools and equipment at their disposal, so whether you want your ducts sealed as a precautionary measure or whether you think they have been compromised in some way, do not hesitate to give us a call today. Well sealed air ducts keep your indoor air quality high, your home comfortable and your energy bills down. When they are not sealed properly, however, all of these functions are compromised. Even tiny breaks or cracks in your duct system can let in all sorts of air pollutants. And they will certainly cause your home heating and cooling system to work harder to keep your home comfortable. When your HVAC systems are working harder, they are using more energy, and that costs you money. They will also be inclined to break down more often and wear out sooner. For all of these reasons, it is best to have your ducts properly sealed by a professional to ensure that the air in your home keeps flowing smoothly and efficiently. Our professional technicians have access to all of the best diagnostic and duct sealing tools and equipment available. When you hire us for professional Arlington duct sealing services, we will inspect your entire duct system thoroughly and then seal all or part of it as needed. We make sure to use only the highest quality materials in all of our duct sealing projects as well, so you can be sure the work we do is meant to last. So whether you know there is a problem in your duct system or you just want to learn more about the ways proper duct sealing can benefit your Arlington home, be sure to give Millie’s a call today.